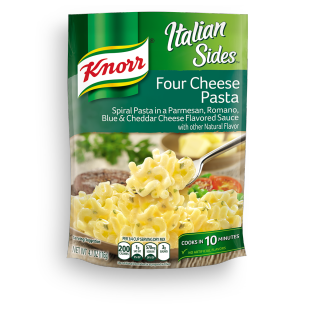 Hearty bow tie pasta covered in Parmesan, Romano, Blue and Cheddar cheese-flavored sauce gives the Four Cheese Bow Tie Italian Sides its authentically Italian flavor. For seafood lovers—try our Four Cheese Pasta with Shrimp & Spinach recipe for an unforgettable seafood pasta. Four Cheese Pasta is rated 4.1 out of 5 by 126. Rated 1 out of 5 by pasta lover from want bow tie back I really an dissapointed that the bow tie Italian pasta was replaced with this one. The flavor is not the saMe. I crave the other recipe it was delectable. Was it unsafe and you replaced it? Not a good enough seller, when it was at stores near me it couldn't stay on the shelf. Rated 3 out of 5 by Catslick from Bring back the bow ties! I can't put my finger on why, but this new version with twisty noodles in place of bow ties just isn't as good. This used to be our go-to side dish and everyone loved it. When I served the new version, the response was " eh." Will start searching the web for the old bow ties. Rated 1 out of 5 by akatrekker from Do Not Buy This!!!!! I have been cooking Knorr Sides for a long time. I followed the directions and after the ten minute timer went off, the spiral pasta was still tough, had not cooked to tender at all. So, I let it cook another 5 minutes, and it was still too tough to eat. My husband threw his out after taking a sample taste. It's very disappointing and I am going to contact the manufacturer with a formal complaint regarding this product. They need to change the pasta out to something else and stop using spiral. Rated 1 out of 5 by I love bow tie from bring back bow tie This replacement doesn't compare to bow tie. Bow tie was my family's favorite, and we'd always buy all the boxes they had in stock, because it would always sell out. I was disappointed when they discontinued it.